There is nothing worse than sitting in your home during a rainstorm and noticing that there is water coming through the ceiling. That is a sure sign you likely have a problem with your roof. At Texas Star, we get it— no one likes the idea of roof replacement. 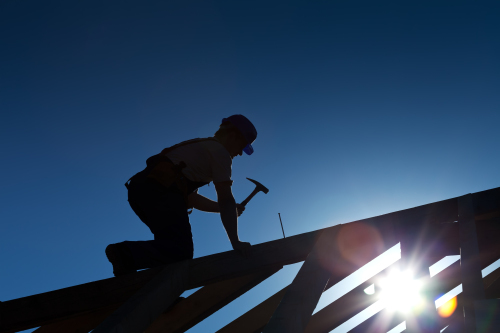 Replacing a home’s roof is costly and takes some time, and is best performed under certain, weather-permitting conditions. Just so you know, typical asphalt roofs have a lifespan of between 12 and 20 years. Some may last longer, and others will start having problems sooner. …But, before jumping to the conclusion that a leaky roof means you’ll replace the whole thing, do everything you can to determine whether it is possible to repair the roof. When Can A Roof Be Repaired? There are many times when a few shingles of a roof may become torn or damaged. It is possible that water can get into cavities that are created, and that can cause a leak. It is also possible that the nails used to attach the shingles are loose or have gone through the shingle, giving water a way to get in. It does not take a large hole to cause a lot of problems with water on a roof. In these types of cases, a repair may be all that is required. Some homeowners may attempt to repair the roof on their own, and others will call in our professionals to help. Either way, it is a good idea to understand the steps of repairing a roof, to make sure that there are no problems in the future. Interior & Exterior — Inspect the roof from the inside and the outside of the home for any problems. A good inspection will start in the attic. Looking for signs of water damage in the attic can reveal where a leak is coming from. On the outside, looking for damaged shingles and nails that are coming out could be a sign of a leak or potential problems in the future. All of the spots that are found should be marked so they can be addressed. Inspect Structure — Water damage will cause rotting in time. It’s important to check the structure of the home for any rot, which will either need to be repaired or replaced. Leak Detection — One of the most important steps in roofing is leak detection. A leaking roof is caused by many things, including damaged shingles, nails coming out, flashing that has been damaged, and leaks around venting, to name a few. Each requires different methods to fix. Damaged / Torn Shingles — It is possible that using tar to hold the shingle in place may fix the problem. For bigger problems, the shingles will have to be removed and replaced. Nail Penetration / Missing Nail — Sometimes a nail will be working its way loose; it can be hammered back into place. The nail may need to be removed if it has penetrated the shingle completely. Once the nail has been hammered down or pulled out, a dab of tar should be placed over the hole. Flashing Problems — The flashing will have to be removed and replaced. This involves removing shingles and replacing them as well. Vent Leaks — A caulking material can help reseal the vents. Many roof repairs are minor. However, when performing roof repair, steps like these ensure the roof is properly repaired. These basic roofing steps also make sure any damage inside the home is resolved. This will restore your home to livable, comfortable conditions, while safeguarding against future leaks. The residents of New Orleans are no strangers to natural disasters. Hurricanes are a threat every year. When a Hurricane such as Hurricane Katrina comes through, the damage can be extensive. When a roof is damaged, it will need to be repaired or replaced. If it is not, water and other things can get into the home causing more damage. In New Orleans after Katrina, the amount of damage meant that getting a roof repaired or replaced was not going to happen quickly. Homeowners had to find a way to protect their roofs until they could get them fixed. The solution was to use blue tarps that were secured to the roof over the damaged areas. This provided a temporary solution to the problem. It also made for some great aerial photos of the city, as so many houses had blue roofs. Find an appropriately sized tarp that will be able to cover the damage, and also can overlap the roof when possible. The tarp needs to be heavy enough to protect the home. Roll the end of the tarp around the wood strips on the top and bottom of the tarp. There is no need to roll the strips around the sides of the tarp. Secure the tarp to the wood strips. Secure the tarp to the undamaged side of the roof. This is done by screwing the wood slats into the roof sheathing. When doing this, make sure that the tarp side is up, so that debris and water will not collect on the wood slats. Roll the tarp over the roof and cover the damaged portion. Secure the bottom of the tarp to the roof, in the same ways as the top portion was secured. Secure the sides of the tarp using wood slats and screws. There is no need to roll the tarp over these slats. Inspect the tarp regularly for any damage until repairs are made. The cost of this work can be less than $100. And the amount that can be saved with a blue roof is much more than that. It is a great thing to know how to do until you can get a professional like Texas Star out to your home to make a permanent repair to your roof. Getting onto your roof to do any type of maintenance or repair is a dangerous task, and it is one that is best left to the professionals at Texas Star Roofing. However, if you choose to go onto your roof for any reason, following these few tips can help to keep you safe. Wear Proper Shoes — Make sure that you wear boots or shoes with good tread and rubber soles when you go onto your roof. This will minimize your chance of slipping. When performing DIY roof repair, steps on fragile tiles can result in breaking, so be mindful of that. Use Gutter Guards — Using a gutter guard can help to keep your ladder steady and safe. It consists of a piece of wood that is fastened to the deck of a roof, and when a notch is put into it, the legs of a ladder can be leaned against them and secured. This will help to ensure that the ladder does not slide while you are on it. Stay Away from Watery Roofs — If it has recently rained you should avoid accessing your roof and should put off any type of work until the area has dried completely. Install a Toe Hold — To prevent slipping and keep your balance, consider installing a temporary toe hold to help your feet to maintain their grip. This can be done by nailing several wooden cleats to your roof deck. Consider a Safety Harness — While this isn’t always necessary, a safety harness should be used when working on a roof that has a steep pitch or is more than one or two stories high. When wearing a safety harness it is important to ensure it is fastened securely to a tie off. Clean it Up — Before you do any type of work or maintenance on your roof you should first sweep the area to clear off any accumulated debris or dirt. This will reduce your chance of tripping while you work. When your residential home is facing roof issues, it’s best to call a professional before attempting to fix it yourself. Sure, you can surf the net for the best answers, but any information found should be compared to that of a professional— not everything you read online is true. Some homeowners choose to fix small repairs to the roof themselves, which is great for saving money and keeping up looks. However, there are a few steps to keep your roofing in good shape after a repair. Improper Fastening — Inadequate or improper fastening can damage a roof. The fasteners and nails that are used to hold the deck of the roof together, and the shingles themselves, should be properly installed to the deck. If it doesn’t look as if it’s done right, chances are its sub-par fastening. Putting New Shingles on top of Old — When you replace your roof or repair it, you should always take off the previous layer of roofing materials, whether it is metal, asphalt shingles, or slate. If you install new shingles on top of the old ones, you run the chances of your roof needing premature repairing. Texas Star professionals will remove the original roof and replace it with a new one. This method saves you time and money in the future. Venting Issues — Many contractors will implement roofs vents to aid with the moisture collection and the heavy heat. This can also keep shingles in one place when the deck heats up or freezes. Not Installing Moisture Barriers — Like vents, moisture barriers help to protect the decking on a home. They are normally laid before any shingles or slates are installed. Choosing the Roof — There are a large variety of types of roofing materials to use when repairing or replacing your roof. Asphalt shingles are normally placed down by pulling off a sheet of paper, and using the adhesive side between the paper and shingle to secure it to the deck. However, this can easily be the cause of many leaks. To prevent any water from getting underneath the shingles, asphalt shingles with breaks between the adhesive strips are more ideal. Flashing Issues — During heavy rains and even light downpours, water can run around chimneys, windows, valleys, and skylights. To prevent this from damaging these areas, flashing is installed. If they are not installed properly, they can cause leakage. A mistake that most people who repair flashing make, is that they use caulking around the area instead of mortar, or don’t align the flashing properly. There are several other mistakes that homeowners make when they are attempting to repair or replace the roof on their homes. To avoid these mistakes, embrace the professional process by Texas Star Roofing. If you choose to hire us, we’ll be able to inspect and give you a reasonable quote before beginning your project. Each year, hail results in over $1 billion in damages to residential roofs in the US, making it one of the most costly natural disasters. After you experience a hail storm, one of the first things you should do is to check your roof for damages. Mineral Deposits on Shingles — When hail strikes the shingles of a roof forcefully it can result in mineral deposits. Specifically, you should check for this evidence of damage around your down spouts, especially if your home has standard asphalt shingles. Leaks — In some cases, hail damage may not be evident to an untrained professional. In many cases, the damage is not apparent until leaking begins, and damage to a roof does not always result in immediate leakage. However, it is important to inspect the interior ceiling of your home after hail and heavy rain in order to detect any possible water damage. Gutter Dings — Checking your gutters for dings and dents is also important when inspecting for hail damage. With some gutters, the material is so thin that even small hail stones can cause dents. If damage is evident on your gutters, the possibility exists that roof damage has also occurred. Dents — If you have safe access to your roof, check the vents, fascia, and drip ends for dents and signs of damage. Hail often produces a damage point or dent that can result in a loss of granule while reducing the life of the remaining roof. If you can find 10 dents within a 10 foot square, it is likely that your roof will need to be replaced. It is important to recognize that you should research on the professionals who are available to perform the work, especially after a severe storm. There are many storm-chasing, semi-professional roofers who will go around to neighborhoods selling their service. You want to ensure that the individual that you hire is not only licensed, but is also experienced, and has a number of positive references. Mother Nature can be very hard on the structural integrity of your home, especially the roof. The roof protects you and your family from the elements, but it sure does take a beating in the process. In addition to severe weather damage caused by hail, hard rain, and branches blown by heavy winds, there are also clever creatures who want to gain access to your home for the same reasons you do: warmth, comfort, and safety. It’s not just bats and raccoons you need to worry about, however. There are other, much harder-to-detect creatures that can do major damage to your roof: insects. There are generally three types of insects that do damage to wood homes in the U.S. Termites are the most notorious, but powder-post beetles and carpenter ants can also rack up the damage. If you are able to gain access to your roof yourself, and feel comfortable doing so, check out the shingles. Look for soft edges that crumble or break off easily. Look under the sheathing, and see if you can spot moisture or the appearance of decay. Soft wood makes an insect’s work much easier. Additionally, you can do a visual inspection of both the interior and exterior walls of the home. Termites create tubes of soil that they use to travel through. These tubes run along the walls of the building’s foundation. Likewise, powder-post beetles leave clues behind in the form of a very fine dust, the result of burrowing into wood. It has the appearance of flour, and the holes they leave can be as small as the tip of a pencil. Carpenter ants also leave behind small piles of chewed wood. Some of the damage done by these insects will be easy to detect, but, to assess the full extent of the infestation, you will need the expertise of a home inspector or an insect control specialist. You’ve no doubt heard the term “bats in your belfry” used to describe someone who is a little crazy. Well, having bats in your attic will definitely drive you batty, and squirrels under the rafters can make you nuts… Raccoons have been known to penetrate into the upper rooms of homes by gaining access under the roof, and our opposable-thumbed friend, the opossum, can do the same. Squirrels — Squirrels love attics like they love giant, hollowed out tree trunks. They can chew their way in through old wood and make a nice nest. They can also chew through electrical wiring, creating safety hazards. Raccoons — Raccoons are curious creatures. They’re clever, strong, and they aren’t afraid of humans. They are definitely bold enough to get under your roof and into your house. Opossums are a similar type of determined animal. Bats — Bats are really no different from other creatures who seek the warmth and dryness of your attic. They can find that spot just under the roof to gain entry. They also like to breed in these confines, and a colony might double its numbers in a single season. Your first course of action is to set traps or call pest control, or a professional wildlife removal company. Once the intruders have been removed, you will need to take steps for prevention. These preventative measures will include roof repair. If your roof is older and is starting to leak or lose tiles and shingles every time the wind blows, it might be time for a roof replacement. In some cases, animals may be gaining access to the attic through an opening caused by a particular storm or the spread of rot in the eaves. In other cases, a determined animal looking for shelter may have caused the initial damage. At the very least, these trouble spots will need to be repaired. This determination is easily made with all free inspections provided by Texas Star Roofing’s professionals. We hope you enjoyed our post roofing repairs, step by step. To get yours, click here or call our specialists at (972) 509-7570 today.